Anyone wishing foray into the world of musical freestyle or musical Kur (from the German kur – meaning freestyle) will have a whole new host of rules to remember. The technical requirements affect more than half of the score, revealing the need to be able to execute with competence and ease in the movements of the level. Technical and Artistic sides of the score sheet actually count for 50% each but the technical components of rhythm, energy, elasticity and harmony between horse and rider are scored on the artistic side (making the technical element more than half of the score). 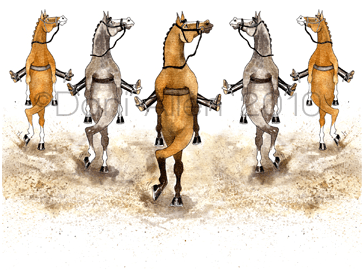 Music for all three gaits needs to be of the same genre; a cohesive flow of musical style throughout the test will give you better marks. The floor plan must incorporate all the technical requirements for the level. You will want to show off what the horse can do well and freestyle is your opportunity to do this. Good freestyles are fun to ride and watch!